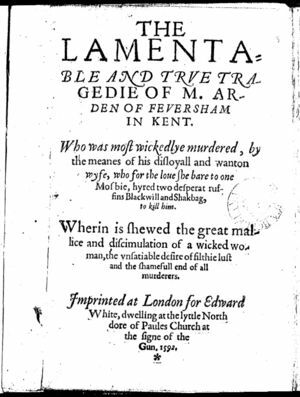 Arden of Faversham (sometimes spelled Feversham), printed in 1592, may have originated as a much earlier play titled The History of Murderous Michael, shown as a court performance in early March of 1578/79 (Clark 252, Ogburn and Ogburn 106, Anderson 148). This came a few months after the printing of Holinshed's Chronicle account of the tragedy. Earlier, in 1573, there had been a royal progress to Faversham (Ogburn and Ogburn 107, 738). Since Arden supposedly started appearing in late 1580s performances, it has been often assigned to Kyd out of Stratfordian desperation (Clark 256). But Clark lays out dozens of pages of verbal and stylistic parallels between Arden and canonical Shakespeare plays (Clark 257-297). And there are numerous Gad's Hill mentions (Ogburn and Ogburn 77). Arden's friend Franklin tries to cheer him up: after all, the Duke of Somerset has given Arden letters patent and deeds to the lands of the Abbey of Faversham (so the king named must be Henry VIII). But Arden's wife Alice has been exchanging love letters and tokens with a fellow named Mosby. Franklin's comforting words are that "it is not strange / That women will be false and wavering (i.20-21). It begins to seem as though it's a class issue with Arden, who is most upset that Mosby is a lowly "botcher" (a kind of tailor/repairman). Through "servile flattery and fawning" to a nobleman (i.28), Mosby has risen to the position of steward and is now acting uppity. Ultimately he will resemble Tyrrell of Richard III (Ogburn and Ogburn 324). Smeared in the channels of his lustful blood. Franklin advises Arden to be patient and kind: "For women when they may will not, / But being kept back, straight grow outrageous (i.52-53). Alice enters, and Arden initially does try sweet-talk: "Sweet love, thou know'st that we two, Ovid-like, / Have often chid the morning when it 'gan to peep" (i.60-61). But such aubade sentiments have been short-circuited since Alice called out to Mosby in her sleep, says Arden. Alice dismisses this. Arden, like Iago speaking to Othello about Cassio, claims Alice then embraced him about the neck. Alice says the dream came from some mention of Mosby the previous night. Arden immediately says that he'll have to go to London on business and Franklin says they'll be about a month. Alice doth protest too much: "Ay me! Sweet Arden, come again / Within a day or two or else I die" (i.85-86). Arden and Franklin go down to the quay for the unloading of certain goods. They'll be back for breakfast and then off to London. Alice soliloquizes about "Sweet Mosby [as] the man that hath my heart" (i.98) and what a drag Arden is. "Love is a god, and marriage is but words, / And therefore Mosby's title is the best" (i.101-102). Adam from the Flower-de-Luce tavern brings word from Mosby that Alice is not to visit him, but she is confused and determined, and she sends a pair of silver dice which they used to play for kisses: "And when I lost I won, and so did he" (i.125). She sends Adam to tell Mosby to come by this morning. When Adam leaves, she curses her husband's jealousy and the blab of "my narrow-prying neighbors" (i.135). Michael, one of Arden's servants, comes to fetch his master's nag. Alice, Lady Macbeth-like -- and some Oxfordians find the plays, and this character, to be related (Ogburn and Ogburn 792, 963) -- confirms that he'll kill Arden within the week in exchange for Mosby's sister, Susan, whom Michael thinks is already betrothed to Clarke, a painter. To rival Clarke's missives, Michael vows, "I shall find a fellow / That can both write and read and make rhyme too" (i.155-156). Michael will somehow get rid of his elder brother to have the family farm in Bolton. Mosby arrives but wants to break it off with Alice. She pitches a fit: "Is this the end of all thy solemn oaths? / ... / Have I for this given thee so many favours, / ... / Made shipwreck of mine honour for thy sake?" (i.185-189). She accuses him of getting her love and commitment to murder through "witchcraft and mere sorcery" (i.200). Mosby tells Alice he was just attempting "To try thy constancy" (i.209). He has a plan: Clarke will paint a poisoned portrait to kill Arden. Alice thinks too much could go wrong. Clarke arrives and eloquently confirms the deal whereby Mosby will allow Clarke to marry his sister Susan. Alice says that if she could have an affair with Mosby without consequences, Arden would not have to die, but whatever. Mosby tells Clarke they don't like the poisoned picture idea, but Clarke gives them poison to put in Arden's drink or food, "And he shall die within an hour after." "As I am a gentlewoman, Clarke," says Alice, "next day / Thou and Susan shall be married" (i.285-287). Arden and Franklin return. Mosby pretends he came to ask about Arden's new lands, but Arden accuses him of visiting Alice. Mosby makes a show of indignation, but Arden grabs Mosby's sword, noting that because of his social status -- a "velvet drudge" (i.322) -- he is not allowed to wear one. Mosby claims he loved Alice once for her beauty but that he's here only because of his own sister. Arden agrees to be friends, saying that the lewd gossip of others got to him. Franklin thinks that Mosby should stay away, but Arden says that he should visit more often to show that all is aboveboard. Alice brings breakfast and Mosby turns it down. Arden senses "there's something in this broth / That is not wholesome" (i.365-366). Alice throws the dish to the ground and defensively acts offended by his constant suspicions. Arden calms her and she pretends to desire his speedy return from London. When Arden, Franklin, and Michael depart, Alice and Mosby remark how close they were to successfully poisoning Arden. Mosby will honor his word to Arden not to woo Alice, who retorts that "Oaths are words, and words is wind, / And wind is mutable" (i.436-437). Nevertheless, while Arden lives, Mosby will back off. Alice considers hiring a London alehouse ruffian to murder Arden for gold. Mosby ducks out when Greene arrives hoping to see Arden with a question about the land transfer. Alice tells him that even his small claim is void now, and Greene swears vengeance. Alice tells him that she is an abused wife, and Greene is appalled. Confirming with him that he means business, Alice gives him ten pounds to hire someone to kill Arden. She'll add twenty more when the deed is done, and he shall have the lease of the land. Mosby and Clarke return, and Alice hints that Mosby will be pleased. She sends Clarke to Susan, assuring him that Michael is out of her favor. She reports to Mosby about the Greene deal. Mosby is worried that so many acquaintances know of their murderous wishes. Clarke and Susan enter, happy and sworn to each other. Mosby now wants Clarke to create a poisoned crucifix he once said he could make. Clarke explains how he protects himself when working in poisons: closely fastened spectacles, a leaf in his nose, rhubarb to cut the smell. Mosby will have his crucifix within ten days. Heck of a first scene, eh? Greene has a goldsmith friend, Bradshaw, point out Black Will and Shakebag. Is the choice of names for these scummy killers intended as a "practical joke against Will Shakspere" (Farina 147)? Bradshaw knows the vile rogue Black Will from his soldier days in Boulogne. The other must be a knave to be keeping such company. Black Will recognizes Bradshaw and sneers at his uppity attitude of not wanting to associate with him now -- not like the old days when he "stole the half ox from John the victualler" and shared it with his friends (ii.24-25). Bradshaw explains his trouble: he is accused of the theft of some plate belonging to Lord Cheiny. Someone sold it at his shop, claiming to serve Sir Antony Cooke. He describes the man to Black Will, who, in consultation with Shakebag, fingers Jack Fitten, currently in Newgate Prison for horse theft. Bradshaw is thankful and, after Greene gives him a letter for Alice, he departs. Greene introduces his own business: hiring them for twenty "angels" (gold coins worth about 10 shillings). For that price, Black Will says he'd murder Greene's own father so he could inherit the land. Shakebag eagerly adds that they'd kill his mother, sister, brother, or all his kin. Greene specifies Arden of Faversham at Aldersgate Street in London: ten pounds now and twenty more when it's done. Black Will wistfully wishes that murder were a legitimate occupation he might enjoy year-round. The goofus doesn't even know that this should be in verse. He signs it "Yours, Michael, or else not Michael" (iii.17). Franklin is more measured in his disapproval than Arden, who includes this latest would-be wooer in "A crew of harlots, all in love" (iii.27). He intends to fire Susan when he returns home. As I to finish Arden's tragedy. He swears he will not wash the gore from his face "Till Arden's heart be panting in my hand" (iii.109). Michael enters and, after some antagonistic exchange in which Black Will reveals that he knows all about Michael's motives, Michael's role is reduced to determining a location for the murder while Will will carry it out. Michael volunteers to leave the Aldersgate doors unlocked and instructs them on the lay-out of the residence. Black Will, Shakebag, and Greene go off to drink. Michael has regrets, but will lead Arden "with a wicked, fraudful smile, / As unsuspected to the slaughterhouse" (iii.205-206). Arden tells Franklin that he thinks Alice is a Hydra of wickedness. Franklin offers the comforting assurance that either "She will amend" (iv.22), "Or else she'll die" (iv.23); and if neither of those take place, realize that many people have twice as much misery. But when Arden goes to bed, in a private moment Franklin's sympathy for him proves sincere. A troubled Michael, mostly afraid of the wrath of Black Will, cries out and tells the men he dreamt of murderous thieves. Arden discovers that the doors have not been locked. All go to bed. In which sweet silence such as we triumph. And Arden sent to everlasting night. Black Will has mild Macbethism too: "I tell thee, Shakebag, would this thing were done" (v.15). They briefly discuss fear, and Black Will takes offense, but they approach Arden's residence. When they find the doors locked, Will vows bloody vengeance against Michael. They go to find Greene now and, at the nearby pub, stake out the house until Michael emerges tomorrow. Arden recounts a nightmare to Franklin in which, instead of a herd of deer, he became the hunters' prey. The description resembles the dream the imprisoned Clarence has in Richard III (Clark 273). Franklin thinks the dream was due to Michael's outburst of night-terrors, but Arden remains disturbed. The two will dine and then return to Faversham.